My coworkers are incredibly supportive when it comes to my artwork. I don’t think anyone finds it odd anymore that my brain does its best work trying to figure out the logic behind a report while my hands are doodling swirls and birds and such. A few especially nice folks have even left me little notes with doodles that made an impression on them which always makes me smile. Most of my work doodles are the kind that happen when I am thinking about something else. They start with a little flower or a swirl and slowly grow through out the day or even the week. Some are better than others. I have plenty that are easily forgotten and also a few that turn into full size paintings or pages in a coloring book. But the other day I was not just doodling. I was sketching an idea for a painting for my sister’s birthday. I knew basically what I wanted to do, but I was not sure about the composition, so while waiting for data to refresh I was trying out different placement ideas. I then got up to get more coffee or something. I knew it was not the kind of drawing someone would stop to look at, so I had no idea why when I came back to my desk several people were gathered around looking at my notebook. They were also shaking their heads and talking amongst themselves. When I got closer they asked my if I was okay and if while I had been sick I had “lost it.” And by “it” they meant my artistic ability. I made an attempt to explain I was trying out a new idea, but they didn’t seem to be buying it. So this post is to show them the finished piece in hopes of redeeming my poor little sketch. I feel like it did its job even though it wasn’t a glamorous one. This little painting (8×10″ on paper) is a bit different from what i normally do. 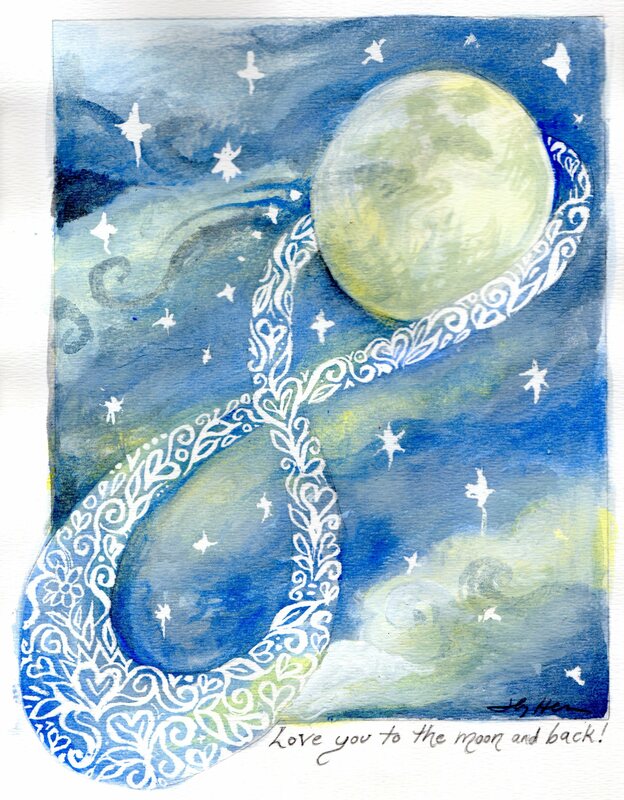 My sister Rachel, who turns 35 today, has always loved and repeatedly used the phrase, “I love you to the moon and back,” so this is my rendition of it for her, cause I love her to the moon and back and back and back, to infinity if you will.